Yesterday, while doing some other things around home and keeping a late afternoon appointment, I was able to be a chaser to help celebrate six months of the VK5 National and Conservation Park award program. Today, I was able to activate three metropolitan conservation parks. I made a concession to the objective of responsible fuel use and, with the aim of successful navigation, I turned on the female voice in my GPS. She really sounds awful! But, I did find the Parks with a minimum of fuss. 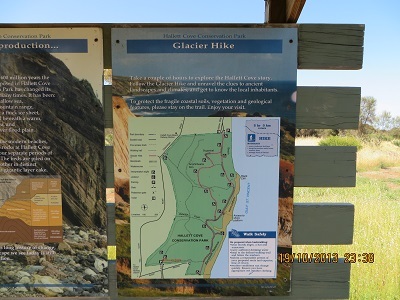 I began early with the Hallett Cove Conservation Park. This is a small park is just 51 hectares. It conserves outstanding geological features including glacial pavements and folded rocks. It was proclaimed a conservation park in 1976. Aboriginal artefacts were discovered in the area in 1934 and more that 1700 pieces were collected. I set up my station just inside the main entrance near the information kiosk. I was able to sit near and under some melaleuca trees which provided great shade. I had contacts with the following stations beginning before UTC rollover at 2240: VK3SAW, Ash, portable in the Grampians National Park with a scout group from Horsham. Ash called me. Then followed VK3YE, Peter as usual pedestrian mobile; VK5LY, Larry, QRP portable in Spring Gully Conservation Park. VK3GRW, Greg in North East Victoria, VK5AV, Tim; VK3BJM, Barry; VK5FAKV, Shawn from Renmark; VK3PF, Peter; VK3MMX, Darren at Harcourt; VK5KGP, Graham; VK5PAS/p, Paul at Minlacowie Conservation Park, my second Park to Park for the activation; VK5TN, Robin; VK5LY/p, Larry; VK3SAT, Lachlan in Central Victoria; VK5ATQ, Trevor and VK5AV, Tim. Sixteen contacts in just under an hour I thought was pretty good. The 40 Metre band seemed to be working well, although the noise floor was higher than I usually experience when in a rural park. All signals were either S8 or S9 with the exception of VK3YE, Peter who I received 5 and 1. 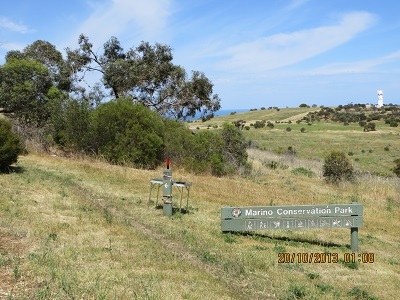 I packed up and headed just a few kilometres closer to Adelaide to activate the Marino Conservation Park. Marino Conservation Park was once a traditional resting and fishing place of the Kaurna Aboriginal people. However, in the early 20th century much of the area had been cleared and grazed. It also conserves coastal heath and provides a green buffer between two suburbs. I found operating from this park much more challenging than at Hallett Cove Conservation Park because of the higher noise floor. There were high tension power lines just across the road from where I set up my station. I had contacts with the following stations beginning at 0031: VK5HCF/p, Col at Gower Conservation Park; VK5PAS/p, Paul at Barker Rocks Conservation Park; VK5AV, Tim; VK5WG, Nev, a very loud 5 and 9, best signal all day; VK5DJ, John and VK5WF, Wolfe, making six contacts. 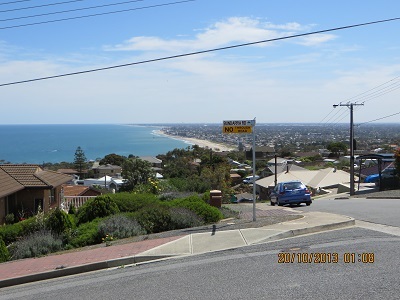 View looking North, Adelaide Coast and power lines, from the corner of the Park where I was set up. I had the following contacts from Fort Glanville Conservation Park: VK5PAS/p, Paul at Ramsey Way Conservation Park on York Peninsular; VK3UBY, Col at Mildura and VK5ATQ, Trevor. These were all difficult contacts because of the very high noise floor. Nevertheless, I am very pleased to have activated this park. This park conserves Fort Glanville which was constructed in 1880. 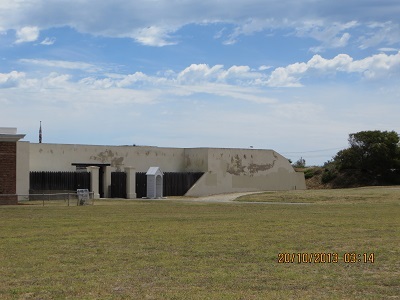 It is an most complete example of a coastal artillery station built in Australia and dates from South Australia’s colonial past. The park is surrounded by a high mesh fence complete with trespassers prosecuted signs clearly displayed. I activated the Park from within the car park. The park is open on the third Sunday of the month, 20th October, and features a re-enactment of military drills, the sound of bugles, complete with the firing of the canon. I will suggest to the Adelaide Hills Amateur Radio Society (I am a member) that we should activate the park during history week during May 2014. Actually setting up a station on the lawns or further away from the main roads and the power lines might make for a more successful activation. Using a radio with better noise reduction capability compared with the FT817 would assist. I knew I should have used the Ten-Tec Argonaut VI! At the end on the day I had activated three parks and enjoyed 25 contacts. I was pretty happy with that.